Gov. David Ige today unveiled his proposed $28.5 billion state budget for the next two years that includes money for severance payouts for Maui hospital workers who will lose their jobs to privatization, funding for new jail space for women offenders, and more money to combat homelessness. Star-Advertiser. Hawaii Gov. David Ige is proposing a state budget that boosts spending on education, housing and homelessness. The plan calls for $28.5 billion in spending on operations and $3 billion on capital improvement projects over the next two years. Associated Press. Hawaii public schools would see a significant boost in funding to the tune of $93 million for operations under a proposed two-year state budget Gov. 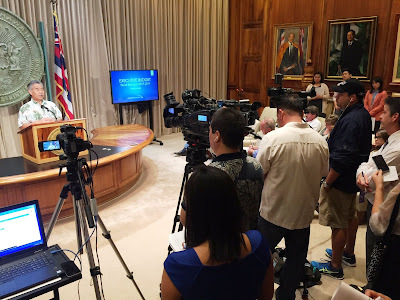 David Ige released Monday. Star-Advertiser. Gov. David Ige’s biennium budget proposal seeks additional money for every state department, with a special emphasis on education. Civil Beat. Hawaii Gov. David Ige is proposing a state budget that boosts spending on education, housing and homelessness. Hawaii News Now. Governor David Ige wants to spend big over the next two years, increasing the state's operating budget to $28.5 Billion. KITV. Gov. David Ige was sporting an aloha shirt featuring ohia foliage Monday, as he announced a no-new-taxes biennial budget that includes money to protect the important tree as well as funds for other Big Island projects. West Hawaii Today. There are several Maui projects outlined for budget allocations under the governor’s proposal including $12 million to repair flood damage and reconstruction at ʻĪao Valley State Monument. Maui Now. Gov. Ige's budget details here. Will 2017 be the year for medical aid-in-dying legislation for Hawaii? Compassion & Choices Hawaii has a new poll showing that 80 percent of Hawaii voters believe a “death with dignity” option should be available for a terminally ill person who is mentally capable to receive a prescription for life-ending medication. Civil Beat. Hawaii’s four Electoral College electors were required by law to vote for Hillary Clinton because she won the general election in the state, but one so-called “faithless elector” voted for Sen. Bernie Sanders instead. Associated Press. Rogue isle elector votes for Sanders, despite Clinton win. Star-Advertiser. Hawaii's electors gathered at the state Capitol to cast their votes for president. Hawaii Public Radio. Sen. Mazie K. Hirono announced that the Hawaii Department of Health will receive $1.1 million in Centers for Disease Control funding to fight the Zika virus. Garden Island. Workout, golf and dinner comprise president’s day. Star-Advertiser. The Latest on President Barack Obama's annual two-week vacation in Hawaii. Associated Press. Hawaiian Telcom is an equal partner with the seven consortium members involved with the Southeast Asia-U.S. broadband cable under construction, and President and CEO Scott Barber said the company would have the power to veto an attempt by a Chinese company to buy out any of the members in order to protect national security. Pacific Business News. The state Public Utilities Commission last week blocked an attempt to take a portion of a $150 million financing program, originally intended to help underserved residents get renewable energy, to be used to pay private companies directly. Star-Advertiser. Honolulu Police Chief Louis Kealoha has voluntarily placed himself on restrictive duty after receiving a letter informing him that he is the target of a federal grand jury investigation, his attorney confirmed Monday night. Star-Advertiser. Honolulu Police Chief Louis Kealoha received a target letter from the U.S. Attorney’s Office on Monday notifying him that he’s a suspect in the ongoing criminal investigation stemming from the theft of his mailbox in 2013. Civil Beat. Honolulu Police Chief Louis Kealoha will go on restricted duty after receiving a "target letter" from the FBI as part of an ongoing public corruption case. Hawaii News Now. Honolulu Police Chief Louis Kealoha received a target letter from the U-S Attorney's office Monday. KITV. Police chief to place himself, other officers on restricted duty amid federal investigation. KHON2. Mayor Kirk Caldwell has returned a bill that tightens rules for private transportation and ride-hailing companies such as Uber and Lyft to the Honolulu City Council unsigned, which means it will now become law. Pacific Business News. Gov. David Ige says both city and state transportation projects need more from taxpayers, but how that tab is collected is up in the air for now, though he’s committed to making a federal deadline on the rail project coming up this spring. KHON2. A trampoline that sits in shallow waters off Laie Beach Park, better known as Pounders Beach, has become Oahu's latest hot spot. Hawaii News Now. For the past several weeks, residents in Moiliili have complained about the dust from the demolition of the University Square building on King Street. Developers are razing the 59-year-old complex to make way for a 14-story, student housing project. Hawaii News Now. Commentary: Diamond Head Slopes Are Absolutely Trashed. New photos from the state depict the squalid conditions encountered in homeless encampments during recent sweeps. Civil Beat. The executive director of the Thirty Meter Telescope said Monday that the TMT International Observatory board is closing in on the execution of a backup agreement to allow construction of the $1.4 billion project on a mountain in the Canary Islands if permission cannot be obtained to build on Mauna Kea by the spring of 2018. Star-Advertiser. TMT International Observatory could seek another partner to finance its next-generation telescope once it knows where it’s going to be built, its executive director said Monday. Tribune-Herald. The chief of the controversial Thirty Meter Telescope project faced hours of questioning Monday during the state Board of Land and Natural Resources Conservation District Use Application contested case hearing in Hilo. Hawaii News Now. The Hawaii Island Energy Cooperative is moving forward with its attempt to split off Hawaii island from the Hawaiian Electric Industries umbrella to become a cooperative similar to the one on Kauai. Star-Advertiser. Hawaii energy co-op moves closer to possible utility takeover. Pacific Business News. Huena Power Inc., the company whose complaint was rejected by state regulators this week regarding planned geothermal energy expansion on the Big Island, is not ruling out further legal action, a company executive confirmed to Pacific Business News. Hawaii County Mayor Harry Kim is aware of the environmental concerns being raised in Keuakaha and Pana’ewa, and shared a sympathetic view of the situation in a recent interview. Big Island Video News. Several cases of mumps were recently detected at separate schools in the Baldwin-King Kekaulike-Maui Complex Area. Maui Watch. Pono Life Sciences Maui, LLC, one of two marijuana dispensaries approved for operation in Maui County, showcased its cannabis education center in Kahului over the weekend. Maui Now. The last field is harvested, the last of the cane processed and the last ship with sugar in the hold has set sail for California. Maui News. Hoping to spur a resolution of a years-long dispute over stream water in West Kauai, the state Agribusiness Development Corporation approved a five-year lease to the Kauai Island Utility Cooperative for its Puu Opae hydropower project. Civil Beat. Maile Alfiler was promoted to member services manager for Kauai Island Utility Cooperative. Garden Island.